Regina (Anna Paquin) is a teenager whose family has moved into an old house in Spain. The house was the site of the disappearance of a number of children forty years ago. Regina’s father begins acting strangely, he occasionally becomes violently angry. Her younger brother begins to manifest a fear of the dark. Eerie shadowy children can be seen in the house from time to time. Regina learns that the house was part of a ritual that can only be completed during an eclipse that happens every forty years. The last time it wasn’t finished, and now the ritual is only one child away from completion. If the occult ritual is successful the world will be plunged into everlasting darkness. I originally saw Darkness on Christmas Day and was underwhelmed. It was an odd choice for a holiday release; I could see this playing better during the fall. It’s very disjointed, and occasionally slow. There was something compelling about it, though. The editing is a mess and it did take me a couple of times through to fully understand what was happening. On subsequent viewings, I’ve come to appreciate how carefully it builds its atmosphere. I’m also very impressed with its understated final moment. Where most horror films are interested in going out with one last big shock, Darkness lets its final image sink in without overly dramatizing it. 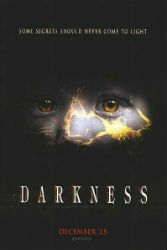 Darkness isn’t a fantastic horror film, but I think it is much better than its reputation would have you believe.